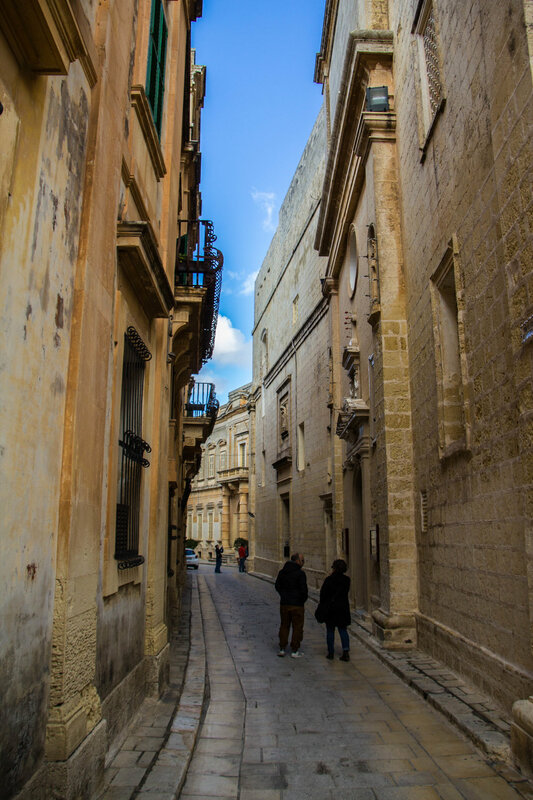 Today we're going to be visiting Mdina, Malta's "Silent City." But before we get to any of this, I have to give a massive shout-out to our new Maltese friend Etienne. We have a family friend back in our home town of Columbus, Ohio who is actually his cousin. 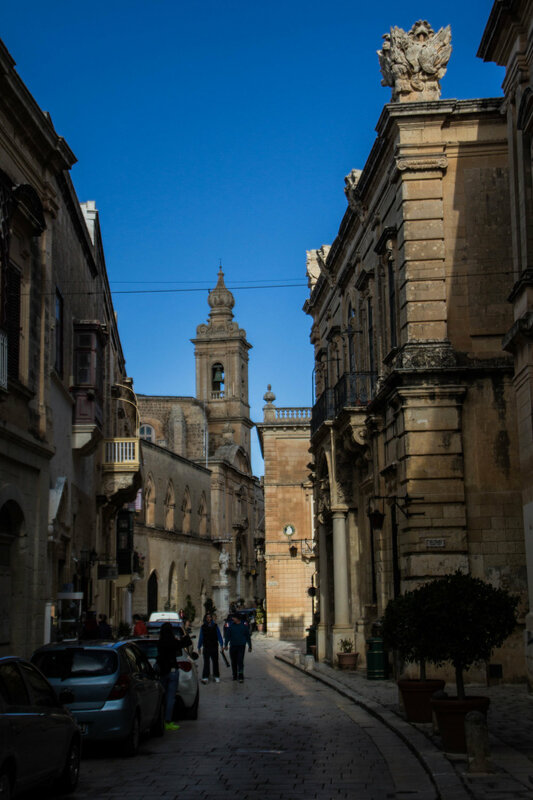 We were introduced, and when we arrived in Malta, he carved off a big chunk of time to show us around the Island he calls home. He was born and raised here, and actually plays in the most popular band in Malta, which is called Winter Moods. You can learn more about them on their website—they're great! Unfortunately they did not do any performances during the few days that we were in Malta, but that freed Etienne up to be our tour guide! 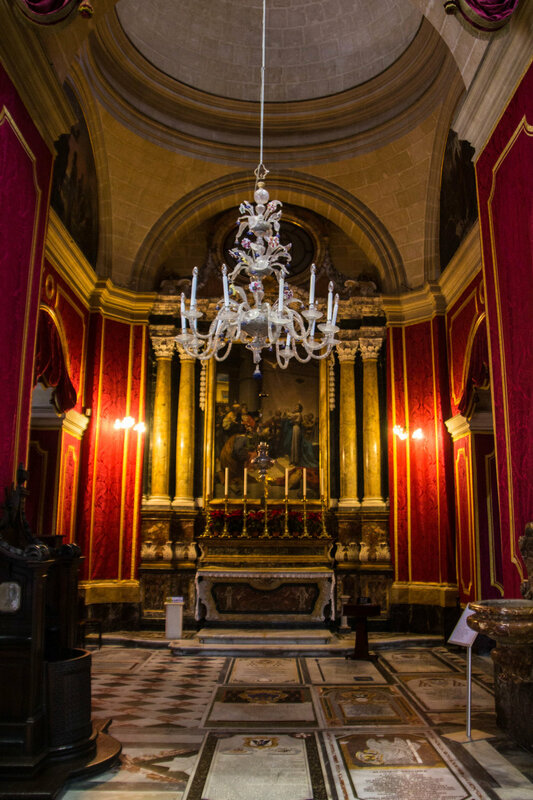 Mdina (pronounced "um-dee-nuh") sits on a plateau, which has been inhabited since the Bronze age. Because the area was easily defensible, it has been occupied more or less continuously since Prehistory. However, the city as we know it today did not take shape until the 8th century B.C.E., when the island was colonized by the Phoenician Empire. In its original form, this city was called Maleth. In 218 B.C.E., Malta was taken over by the Roman Empire, and the city of Maleth was renamed to Melite. The Romans expanded the city to be approximately 3 times its current size. 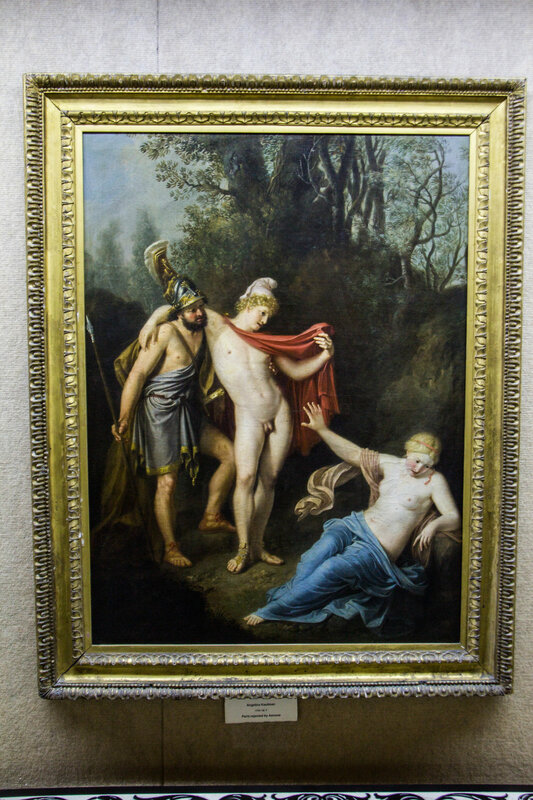 When St. Paul shipwrecked in Malta (I talked more thoroughly about this in the previous article), it was the governor of *this* city, named Publius, that greeted Paul. Today, very little remains from the Roman era of this city. After the fall of the Roman Empire, in the interest of making the city easier to defend, a retrenchment was built which reduced the city to it's present size. The next colonizer of Malta was the Byzantine Empire, who held the city until the year 870, when it was sacked by the Aghlabids (hailing from what is now Tunisia), who massacred all the city's inhabitants and looted the churches. They took the marble in this city and used it to build the Castle of Sousse (in Tunisia). After this, the city was a ghost town for a few hundred years. Today, although there are still full time residents, the city's primary function is as a landmark. 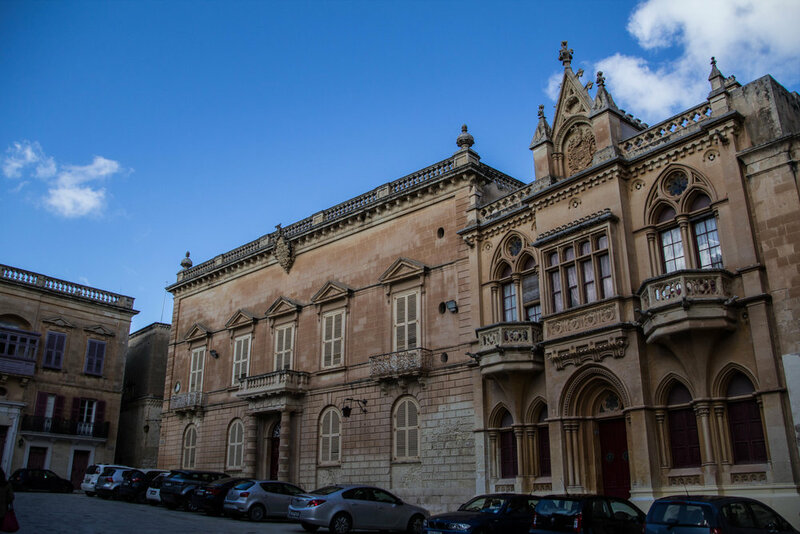 Why Is Mdina Called "The Silent City"? 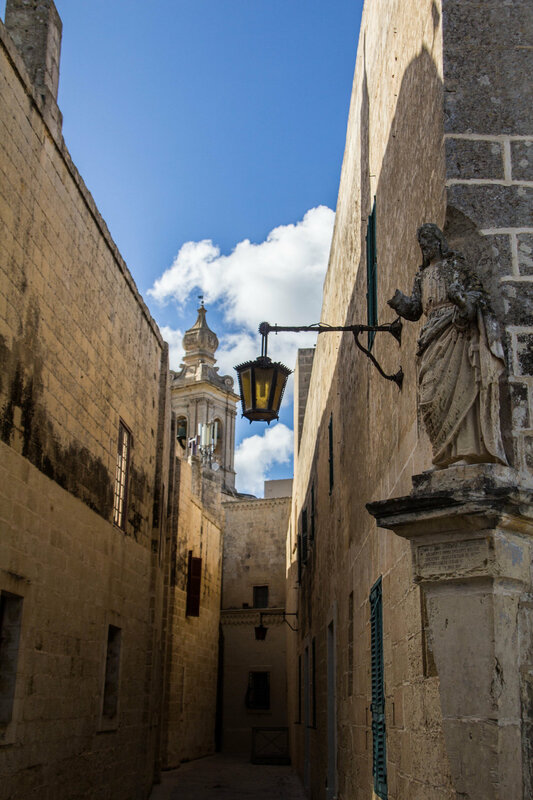 Mdina was originally given the nickname "the Silent City" in reference to it's sudden departure from political importance in the 1500s. 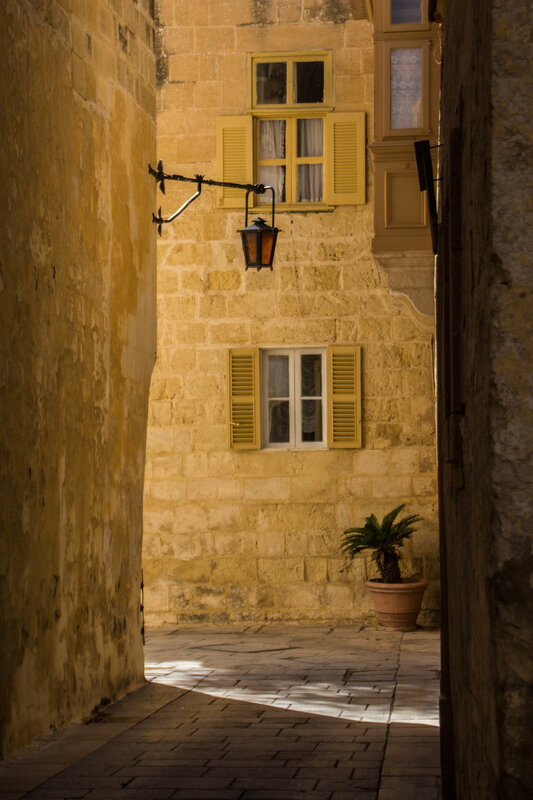 When the capital moved to Birgu / Valletta, Mdina was suddenly a lot quieter. 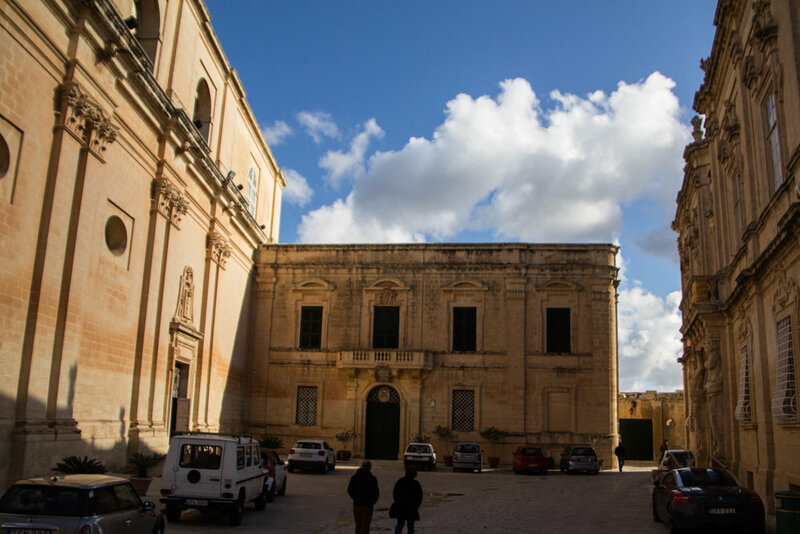 And with the rise of the neighboring city Rabat as the more important population center, Mdina was starting to look pretty vacant when compared to its glory days. Today it retains the name because the city is absent of cars, except for those belonging to residents. Businesses must adhere to strict noise regulations and for the few cars that remain, honking is forbidden by law. 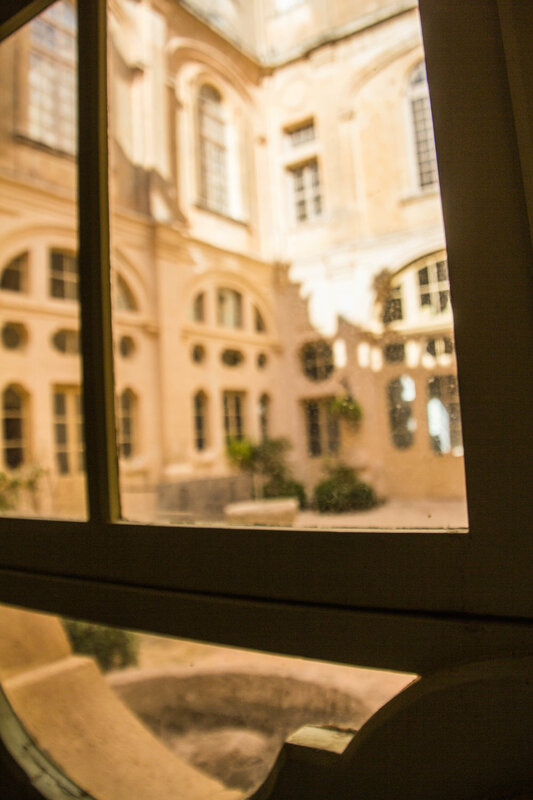 This helps Mdina retain the same feeling that it has always had. Walking the corridors of this city, things are, indeed, largely silent. This family friend who connected us to Etienne (shout out to Ginny!) had given us one solitary piece of wisdom before our arrival in Malta. That wisdom was as follows: do not leave Malta without trying Pastizzi. 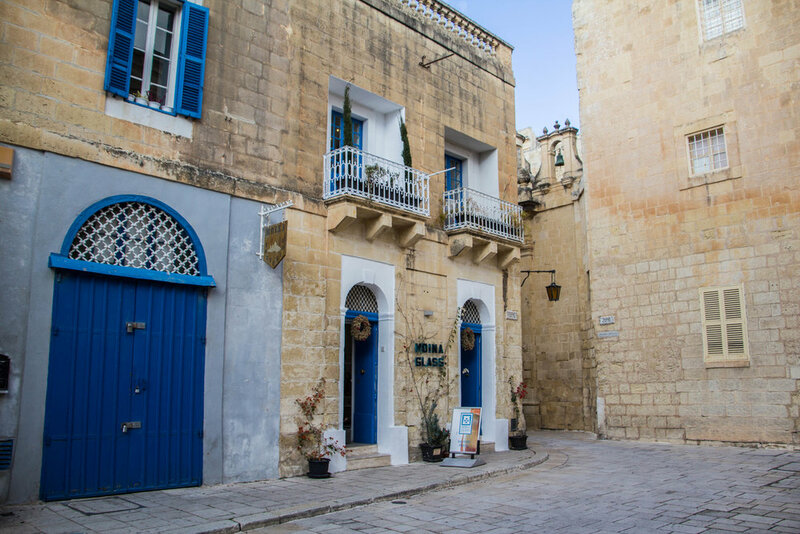 When we arrived at the gates of Mdina with Etienne, our first order of business was to stop for a snack. Etienne led us into a small hole-in-the-wall restaurant called the Crystal Palace (Google Maps link) that specialized in one pastry in particular: Pastizzi ("past-eat-zee). This restaurant was just across the street from the medieval gates of Mdina, in what would probably be considered the outskirts of Rabat. At 6-4, I towered over the many Maltese customers that were in line. The Maltese are not a tall people. Etienne ordered a small batch of the pastries for us to try and we found a place to sit. 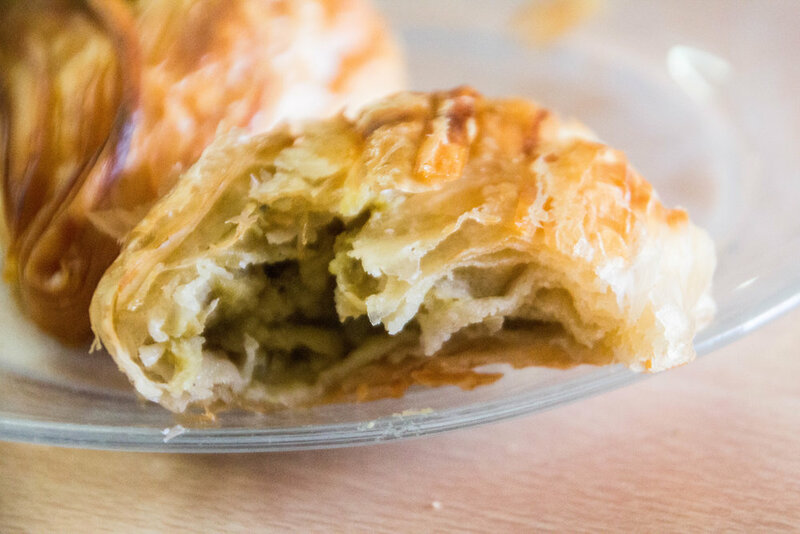 Pastizzi is essentially a greasy, crumbly croissant with some sort of filling. 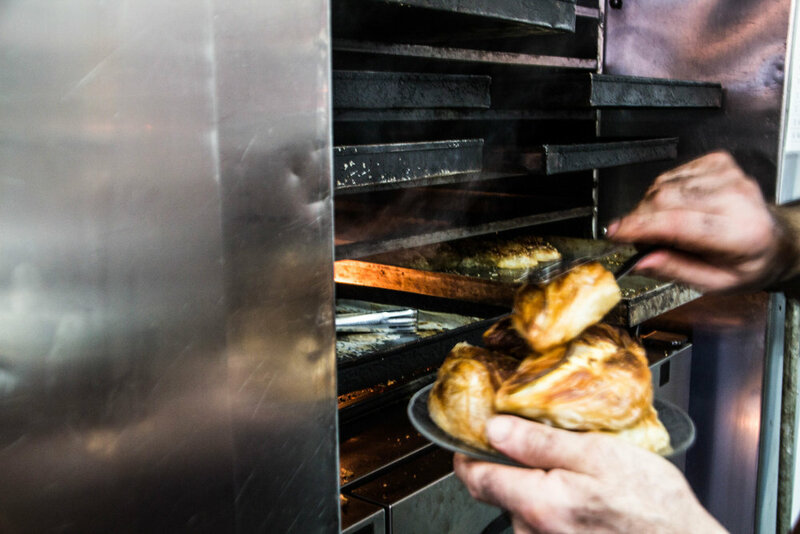 The two most common fillings are ricotta cheese (pastizzi tal-irkotta) and mashed or curried peas (pastizzi tal-piżelli). We got a few of each, and they were both awesome, although a little heavy in the stomach. Pictured below you will see pictures of each type of filling. 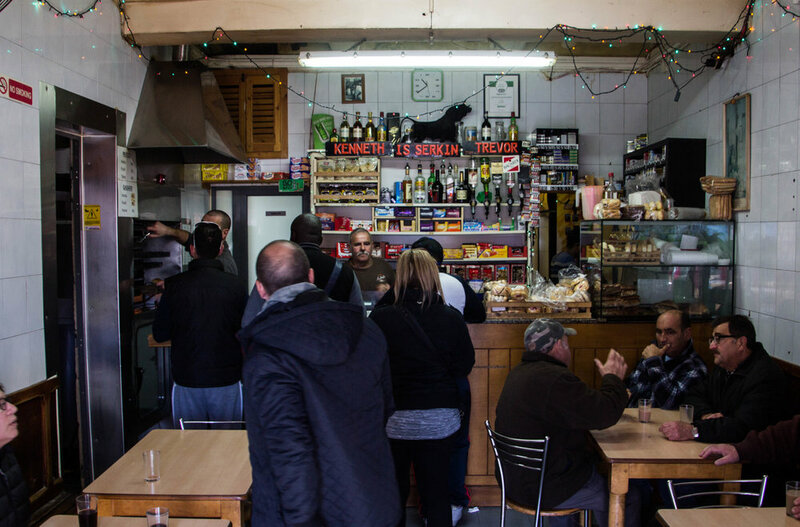 While the Maltese language has strong ties to Arabic, the food and culture feels much more closely tied to that of Mediterranean / Southern Europe, like Greece or Sicily. 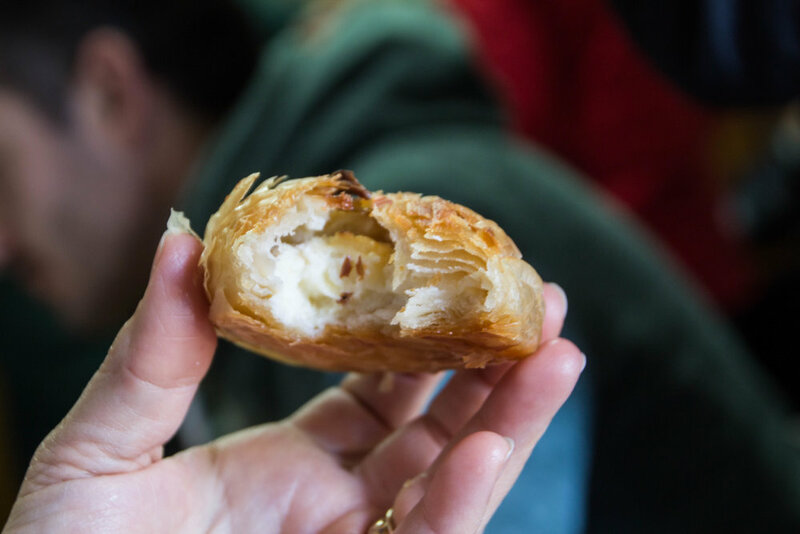 Quintessentially Maltese, these pastries are a unique cousin to the many delicious pastries of neighboring cultures. If you come to Malta, try one. 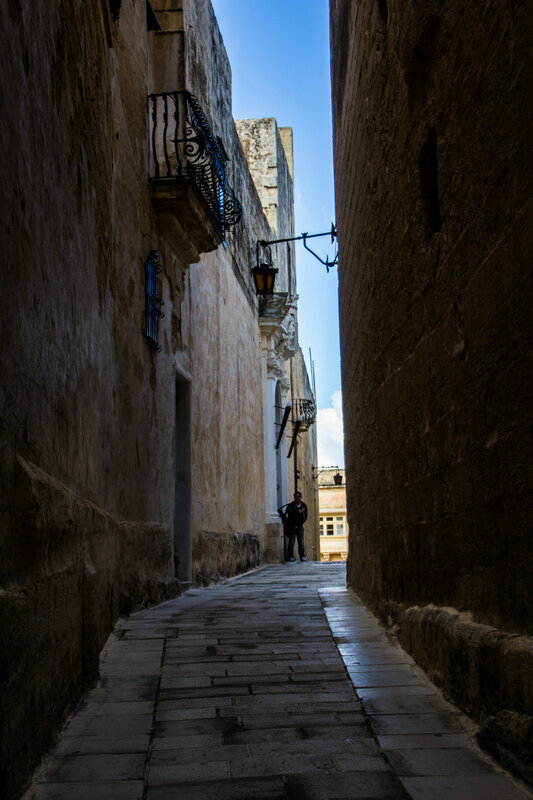 And now, onward, into Mdina. 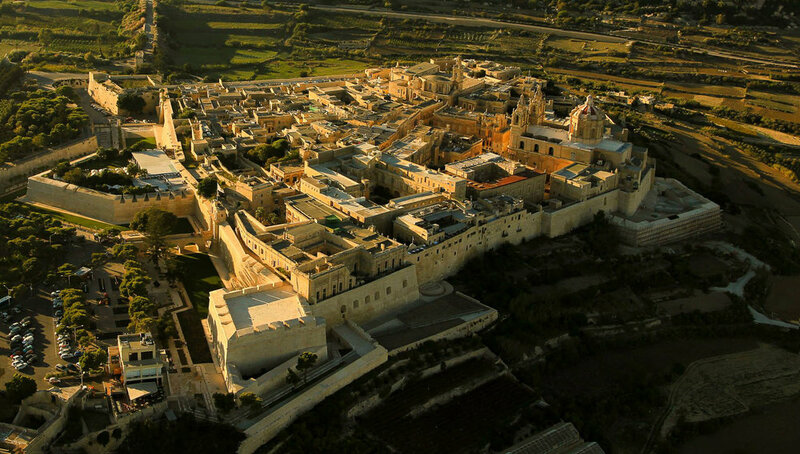 I want to kick this off by showing you a really cool drone photo of Mdina that I found. I think it will be really good context for the photos you are about to see. 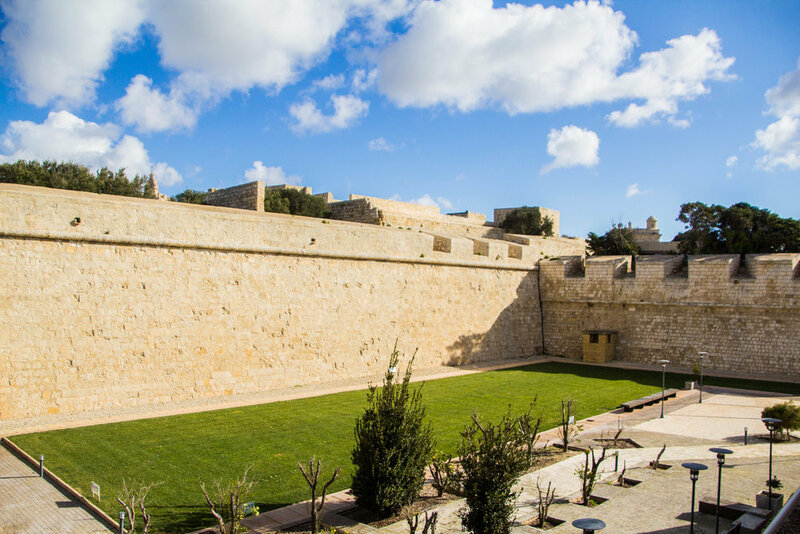 The dynamics at play in Mdina are defined by the fact that it is very small, extremely well-fortified, and essentially sits on the edge of a small cliff. 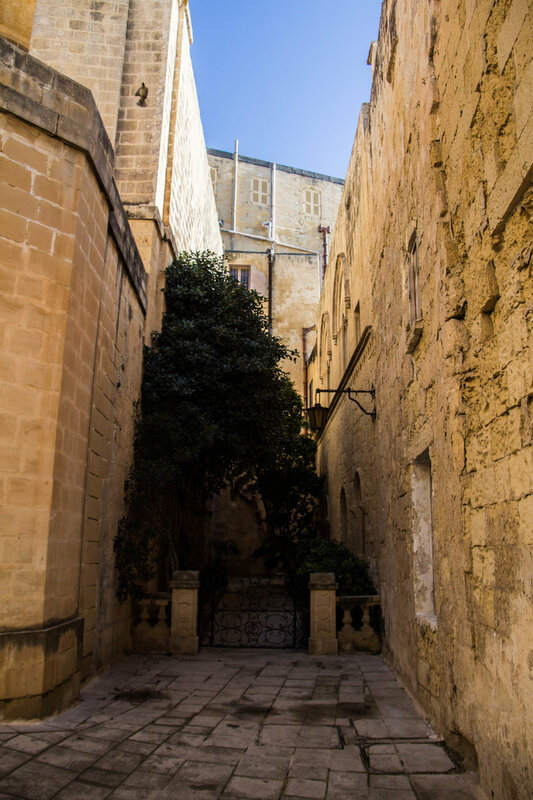 It's at the top of a steep hill, and in true medieval fashion, the side of Mdina that is not a 200-foot drop-off, is surrounded with a sizable moat. Although it no longer holds water or crocodiles, it is still a substantial barrier to entry. The only paths into and out of this ancient city include long tunnels through stone ramparts and bridges over the moat. And all around the city, the Mediterranean wind whistles through the vacant corridors and rustling branches. It's a very cool vibe. This first set of photos comes from the walk through the front gates. You will see the now-empty moat has a small lawn in the middle now, along with a few gardens. Meanwhile, the stone walls still stand strong, perfectly preserved. Walking through the city's gates, the first sound we heard was the clopping off horse hooves. And out from around the corner came a horse-drawn carriage. You will see pictures of this carriage later in this article. We took our first right down a narrow alley, and things were quiet and vacant from that point onwards. The only noise was soft voices being carried on the cool wind, echoing down the stone corridors. 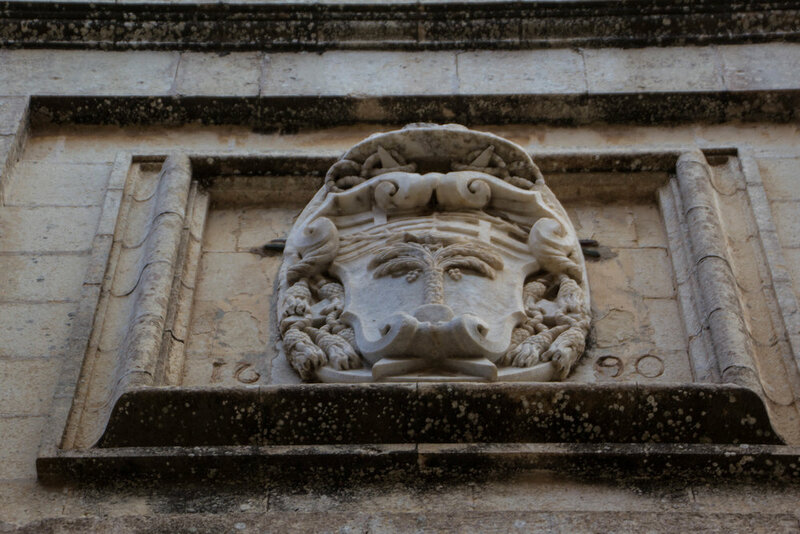 Mdina was a city that never broke character, even for one moment. Every inch of the streets were cobblestone, with formidable stone walls rising up on either side. Perched here and there we would see elaborate stone carvings of coats of arms and gargoyles. It was very evident that this city had not changed in a LONG time. The only evidence that we saw of the fact that we were in the year 2018 were the few small European cars parked here and there. Mdina is known as the silent city because of the restrictions on cars belonging to anybody other than residents, and it seems that what few residents there are in Mdina were not doing much on the day of our visit, because we did not see a single car in motion during our entire time here. The windows were mostly closed, and the beautiful balconies were mostly uninhabited. It felt sort of lifeless, and to be honest, I was having trouble picturing it any other way. 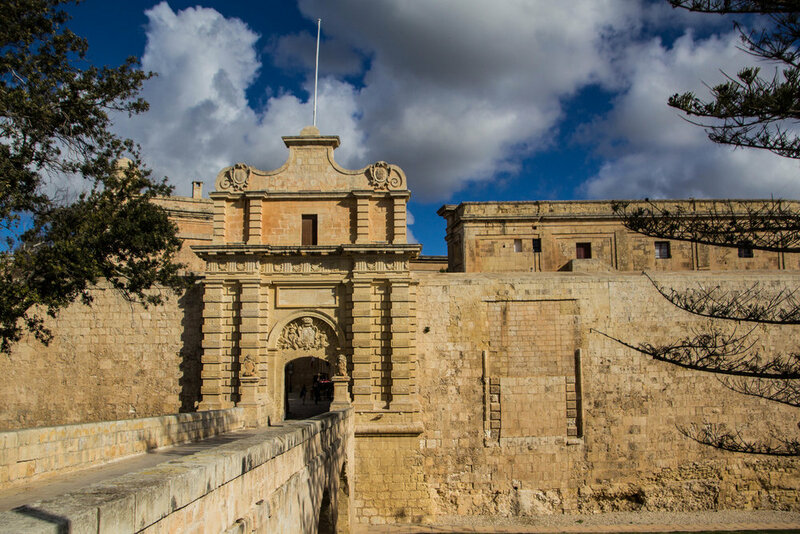 I mean, can you imagine living in this old Maltese castle? You would have to drive over the moat in order to get to the grocery store. After a few minutes of walking, we arrived at Pjazza San Pawl (which, as you can probably guess, is Maltese for "St. Paul's Plaza"). Here, there was a giant cathedral, which also bears the name of St. Paul. You will see images of this square above, as well as the cathedral, which occupies center stage. So obviously we had to go in, and when we did, we were pleasantly surprised to find that the people who run this church also run a medium-sized museum. 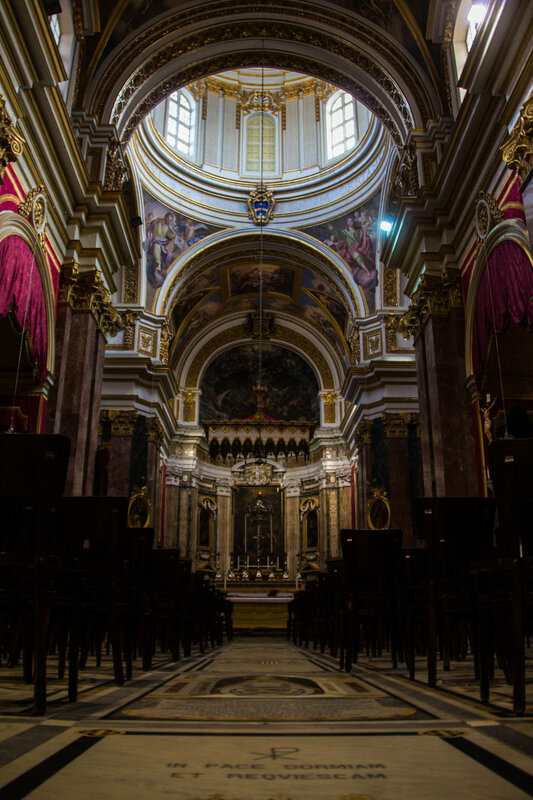 St. Paul's Cathedral was built durng the 12th century, and according to local tradition, stands on the exact spot where then-Roman governor Publius met the Apostle Paul for the first time, after his fabled shipwreck on Malta. 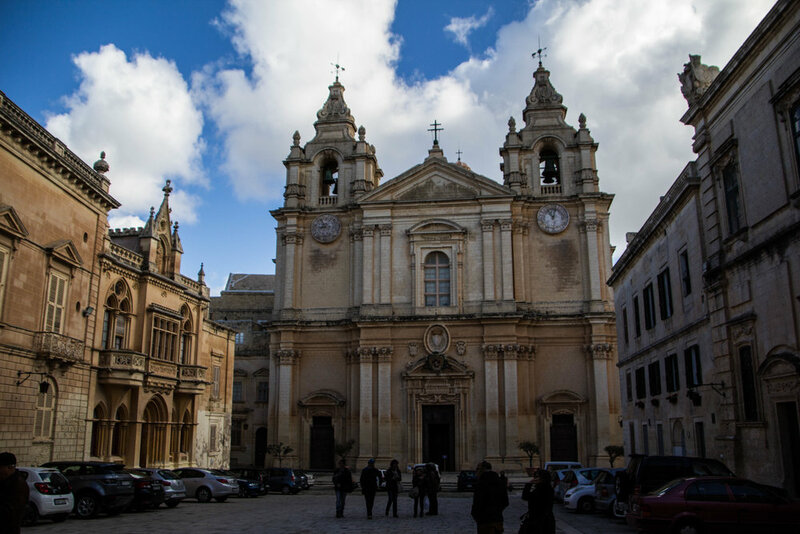 The original cathedral suffered such severe damage during the Sicily Earthquake of 1693 that much of the church had to be torn down. 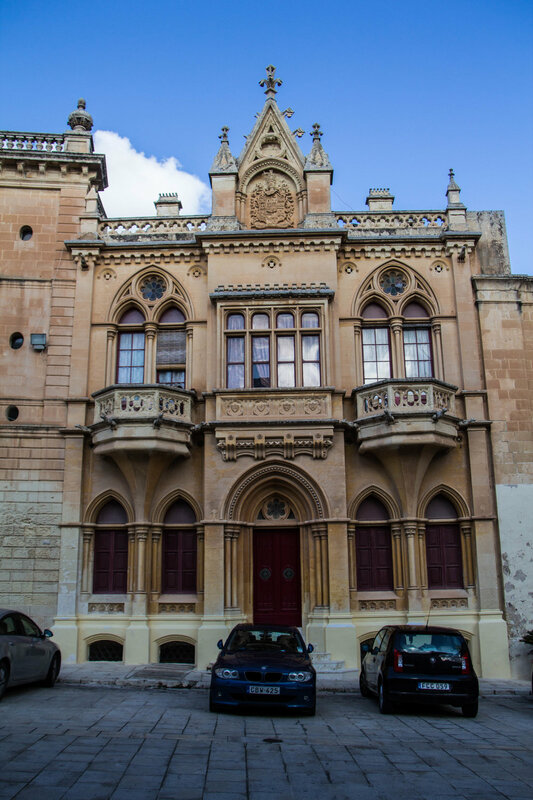 However, it was then rebuilt in the Baroque style according to the design of Maltese architect Lorenzo Gafà. 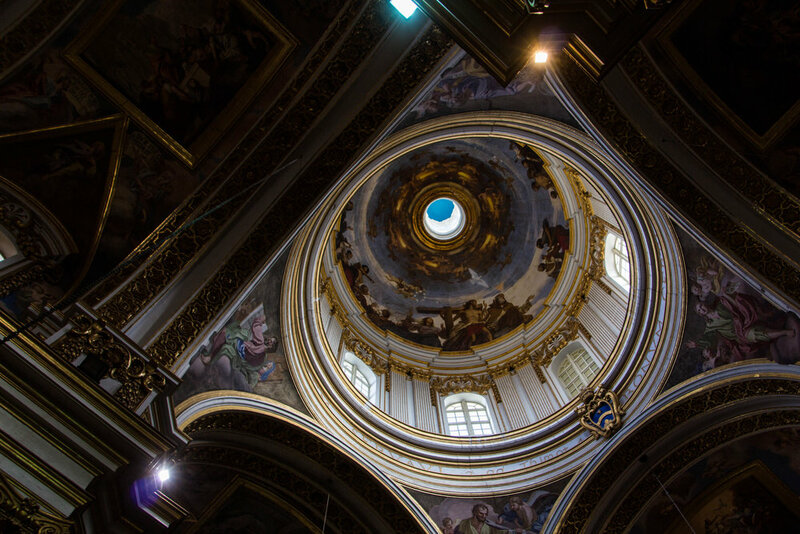 St. Paul's Cathedral 2.0 was completed in 1705 and is considered to be Gafà's masterpiece. 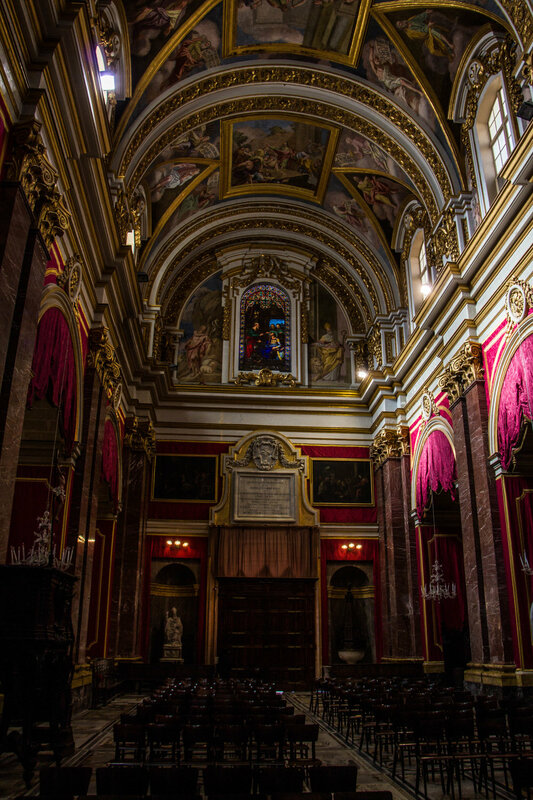 In addition to being a very notable site within Mdina, St, Paul's Cathedral is also a place of national importance, as it is the Archdiocese of Malta. 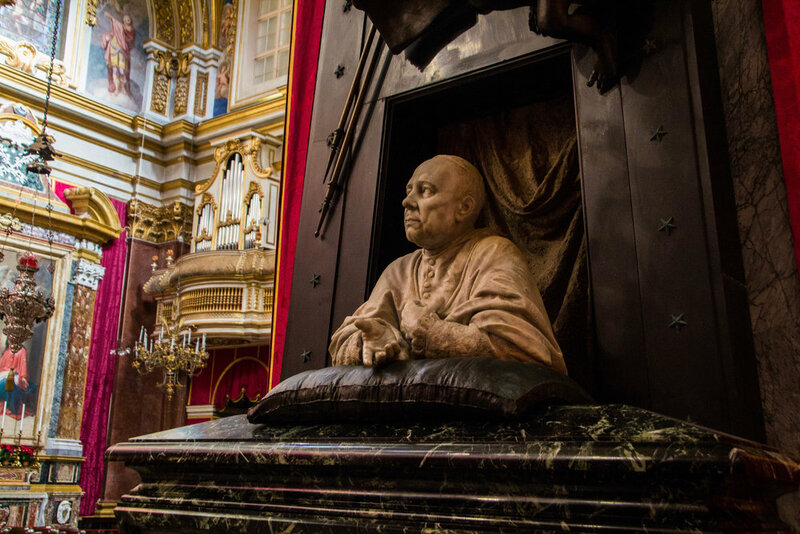 It shares this title with St. John's Co-Cathedreal in Valletta. (That's Catholic lingo for being the most important church in a given country). 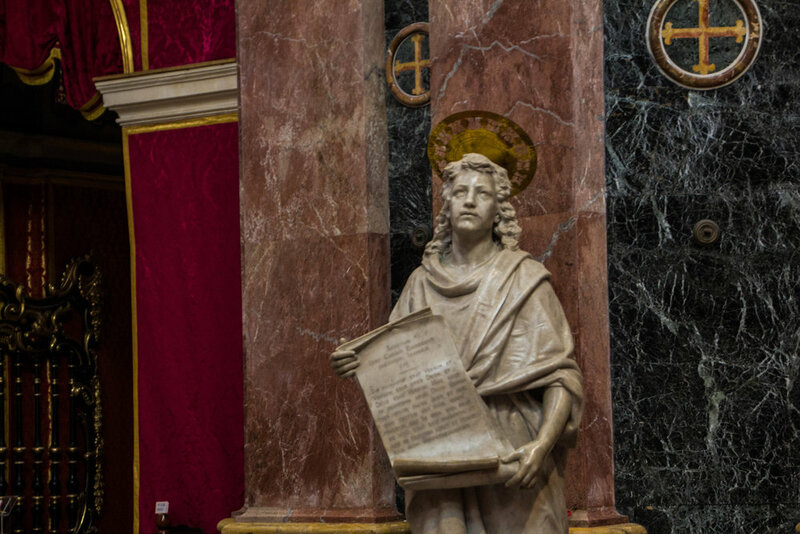 The story goes that St. Paul himself established the Diocese of Malta in the year 60 A.D., which was also when he ordained the Roman governor Publius as the first bishop of Malta. 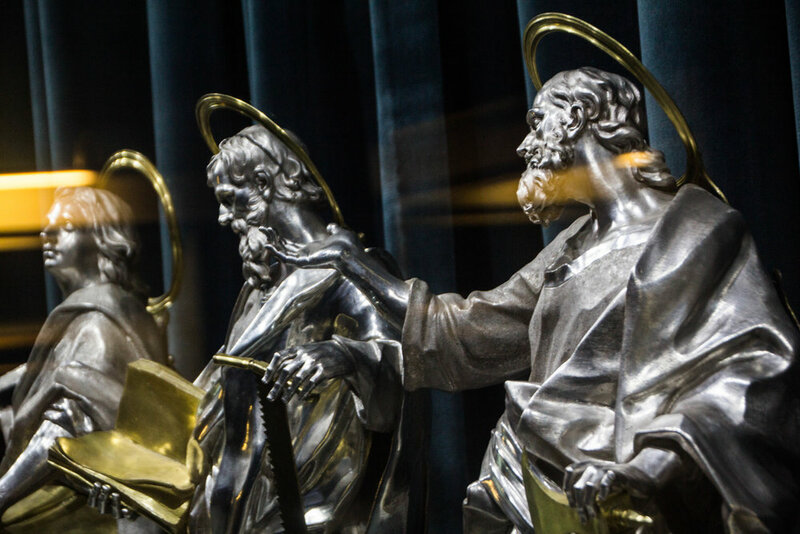 Did you know that Publius also became the first Maltese Saint? Well, he did! Although you may not have known it at the time, you've already seen the exterior of this church. It was the header photo for this article, and is featured in other shots in the gallery above. Now it's time for us to go into the church, and if you ever decide to visit for yourself, I'm going to warn you that there is actually an entry fee. Paying this fee affords you access to both the church AND the museum, which I will get to next. The cost for 1 person is 6,00 EUR (6.15 USD). Like any good cathedral, the whole place is full of dead people. The floor tiles are the shape of coffins, each with engravings to let you know whose body you're walking over. 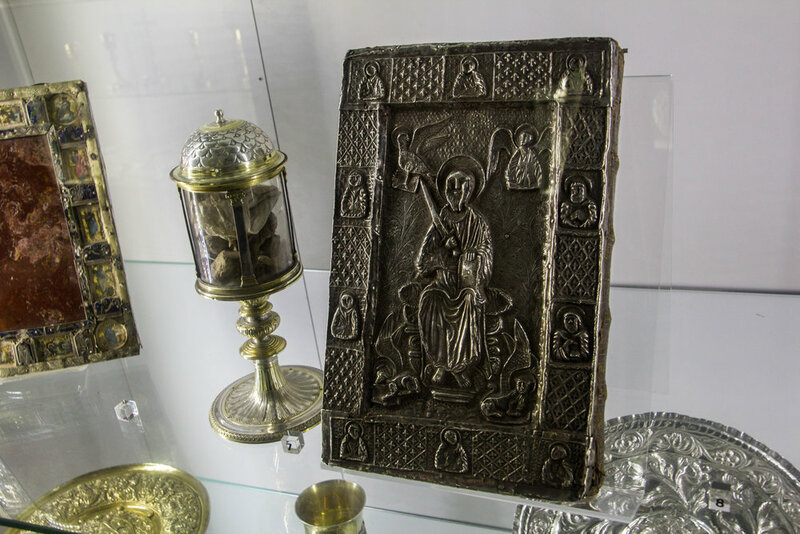 The museum itself is filled with interesting and elaborate artifacts that had, in the past, been used in connection with the church. The building that now houses the museum (directly adjacent to the church) was at one point a seminary. 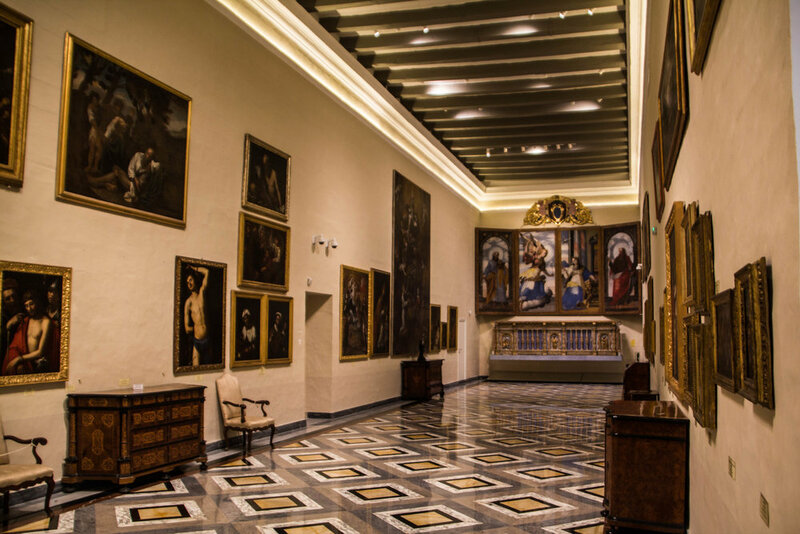 The museum only came to occupy this space in 1969. although it was actually founded in 1897, at which point it was small enough to fit in the halls outside of the main chapel. 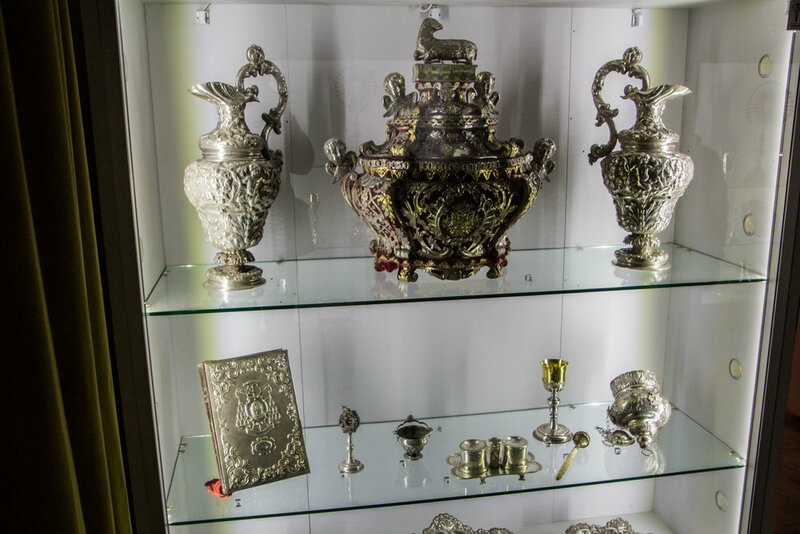 However, there are still small museum-like displays located here for the public to see. The galleries above and below show a mixture of the museum and the cathedral. Both were beautiful, but fairly limited. 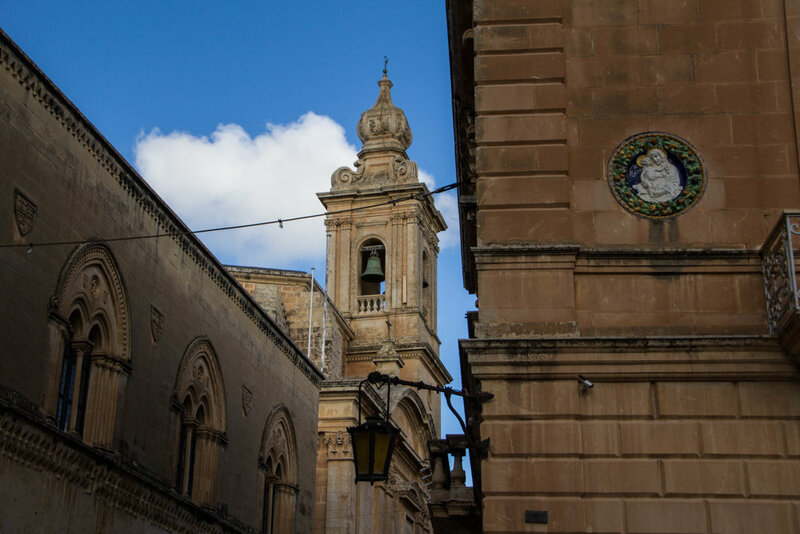 Mdina is a small place—small enough that you can walk a full lap around it in less than 20 minutes. However, you could easily spend hours here stopping into places like these. But now, our walk will continue . 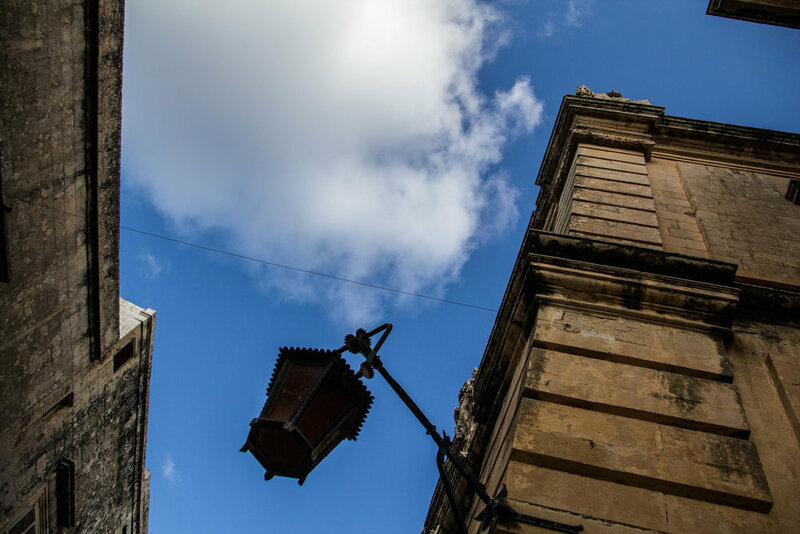 At the south side of the city, there is a space where the buildings fall away, leaving a long horizontal space with nothing but sky visible over the wall. 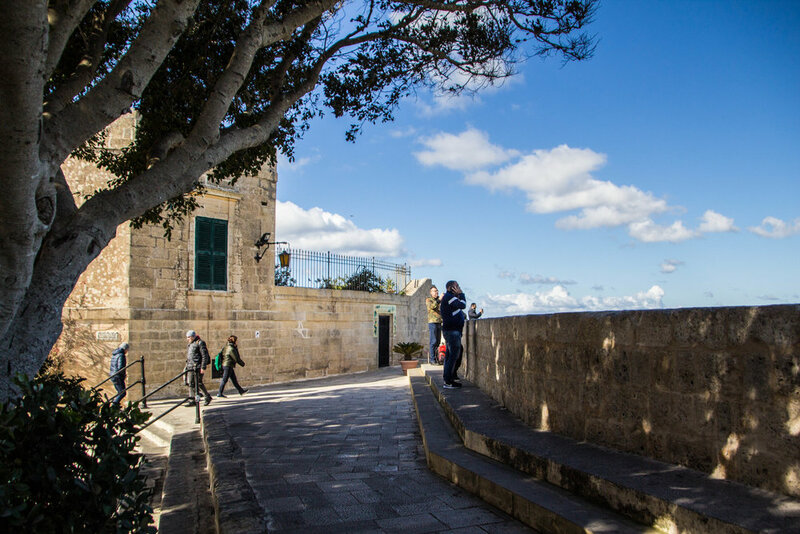 Up a small flight of stairs are the ramparts of the castle that is Mdina, and from here, you can see for miles. 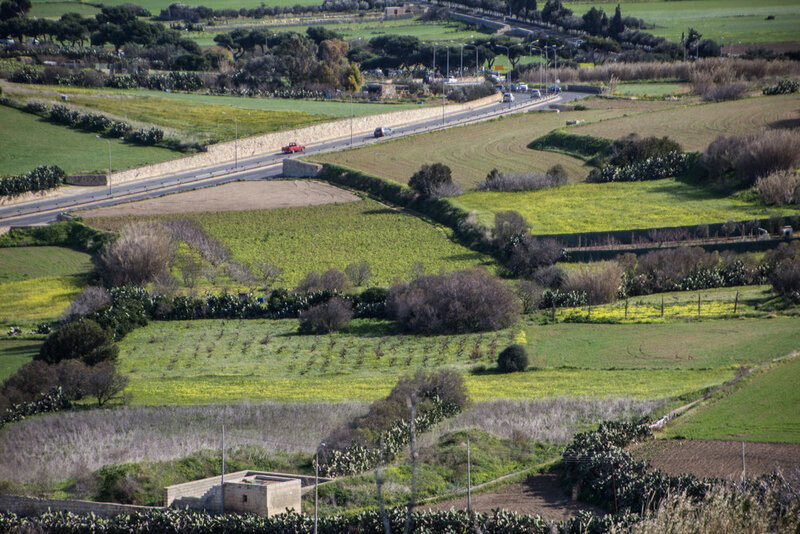 Looking at Mdina on the map, I would not have expected to be able to see the ocean from it, but there it was. I could see the coast of Malta curving off into the distance, and that was the moment that I truly understood how tiny country is. I mean, I already had some idea, and it was a surprisingly short drive to get here, but seeing it all in the same frame like this really put it in perspective. That water is petty damn blue, and it's also our next destination. Stay tuned for our 3rd and final destination in Malta for this go-round: the gorgeous fishing village of Marsaxlokk. (Check back next time to learn how to pronounce that!) Sitting right on the water, the vibrantly colorful, traditional Maltese fishing vessels sitting in the teal-blue water of this village from an iconic image of this country that will haunt your wanderlust-ing dreams. But for now, it's back to Etienne's car.